Organising Committee: Brian Vear (Chairman), Steve Pennicott, Jim Lowe, De Fraser, Ray Hammon, Don Todd. The event this year followed a year of debate over the State of Origin rules. A broken oar in the WA boat held up the start of the race some 30 minutes. The Victorians were very keen to avenge the defeat to ACT in the previous year. 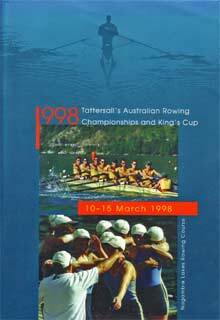 The quality field provided great competition including the NSW crew containing six of the 1997 Australian eight. In a hard fought race, the Victorians won by over a length from NSW with WA a close third. The Victorians had a minor lead at the 500 metre mark but broke free in the second 500 metres getting a three second gap on the field at thenhalf way mark. They held onto the lead and won by 4.3 seconds in the end. It was a race fitting for the first Interstate Championships conducted at Nagambie Lakes. Only three States fielded starters in this Championship. Duncan Free led all the way but was pushed by Jason Day throughout. The margins were about 3-4 seconds for the middle part of the race with the final margin narrowing to two seconds. This was a typically tough lightweight four battle with NSW leading throughout the race, but only marginally. The finishing margin being less than a second between first and second and two seconds back to the third placed Tasmanian crew. The Victorian eight led throughout the race and extended their led in the last 500 metres to win comfortably. The Victorians started strongly taking a two second lead at the 500 and this lead was reduced through the middle of the race by the SA crew who maintained great pressure on the Victorians. The Victorians withstood the tough racing by the South Australians and won comfortably in the end. It was a tight first 500 metres between Douglas and Roye but Georgina Douglas broke away strongly in the second 500 metres and the race was effectively over. The Victorians had a good race with the Tasmanians for the first 1500 metres of the race and then a good race with the fast finishing NSW crew over the last part of the race when the Tasmanians tired. This was a strong win to the Victorians who won by a comfortable margin.